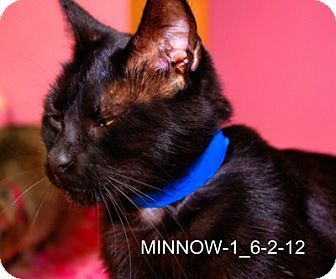 DOB 6/08 Minnow is a silken-soft, handsome boy whose sleek black fur sets off his beautiful green eyes. He is quick to say Hello, forthcoming with purrs of amplitude, and reliably accepting of soothing attention. He does not hesitate to gain access to a lap -- even if it's already occupied by another cat!When he's had his fill of affection and lap-sitting (during which time the lap owner might idly enjoy looking for a stray white hair in Minnow's coat -- kind of like seeking a needle in a haystack), he will curl up contentedly nearby to keep you company.Minnow is a good sport. Might you be his pal who could provide a forever home? For all pet inquiries and for faster service, please contact the Adoption Director by email at adoptions@dognkittycity.org. If you need to speak with someone, you can call the shelter and leave a message at 214-350-7387. If you are interested in adopting this pet you will need to submit a filled-in adoption application (dognkittycity.org/2/adoption-application.html) to the Adoption Director in person, by email, or by fax at 214-484-6695. Adoption DirectorEmail: adoptions@dognkittycity.orgFax: 214-484-6695 Dog & Kitty Citydognkittycity.org2719 Manor WayDallas, Texas 75235 Phone: 214-350-7387Hours: Daily 11:45-5. Closed holidays. Please note that many of our dogs are at off-site adopt-a-pets on Saturdays, and some of our pets are in foster homes or other off-site adoption locations, such as PetSmart. Please email us to verify that the pet you are interested in is at the shelter prior to visiting us. GREATER DALLAS INQUIRIES ONLY, PLEASE!If you are interested to help us continue to provide assistance for homeless pets, please make a donation.